As I mentioned here, I am hosting a giveaway courtesy of All Modern this week. I have selected three different items that are available for sale on All Modern; the winner will be able to choose one of these items. This giveaway is open worldwide (see below). Lately it's been cold and wet, and I have had nights in more often. I would be happy to surround myself with such pretty things while staying home. I hope you agree. I also hope you like my choices! They are for you! I had to choose something from the Chinoiserie collection by Dwell Studio. Vellum placemats, set of 4. The lamp hanging at the top of this picture is the Midsummer Light, designed by Tord Boontje for Artecnica. The winner will receive the lamp in white. I picked this one because I have it, and I love it, and everyone who sees it also loves it. Another Dwell Studio item: an organic knit blanket. If you click the link you will see this item wrapped around an adorable little baby! Keepin' warm! I choose this item one night when it was really cold. I wished I had one. It is made of unbleached, organic Egyptian cotton. To enter, please visit All Modern, take a look around (might I recommend the Herman Miller section? Or Kittypod? Wow), and then leave a comment here. Please leave your email address (formatted as I have mine formatted in the sidebar to avoid spam -- there will be no mailing list business) if it is not readily available in your profile. Tell me which item you would pick if you won, or tell me about your dream bedding or sofa, etc. You can write anything at all. This giveaway is open to everyone, no matter where you live. At the moment the shop only offers shipping within the US and Canada (for the record, I am not getting anything out of this, but I do think it's nice that they offer free shipping within the US and Canada on most orders). I have arranged with All Modern that if someone who lives elsewhere wins, they will ship the item to me and I will forward it along. I could not run a giveaway that was closed to my international pals, even if it will take a little longer for the item to arrive! Please don't keep your address from making you enter. I will choose a winner at random on Friday, October 30. Thank you, All Modern! Good luck! Thanks for giving us the opportunity to participate in this giveaway. It would be awesome to win something as I love your selection, very nice and pretty. Anabela, I love everything you've picked… I've been eyeing that Tord Boontje lamp for years! With the Todd Boontje lamp overhead, I may not get out of bed for the entire winter! Thanks so much for the opportunity! I hadn't been to AllModern before- thanks so much for the introduction! I have long been OBSESSED with the Midsummer light, so that would be my pick for sure. Just tweeted this contest. Username = stringsong. Ooph, the Dwell Studio stuff kills me! I would go for the blanket, no doubt. Lately I have been settling down to read on the couch and an hour later I am shivering there but too engrossed in my book to get up and find a blanket! (Plus I do not have one nearly this cute - does the baby come with it?) I have the lamp also, in white, and it is the number on thing in our house that people flip over! saw this on lisa/ stringsong's twitter! i LOVE the blanket!!!!! The Zinnia rug! As you said ... wow. (Although it's so predictable that I go straight for the thing with a huge flower on it). It is beautiful stuff and I had not heard of the company either. Thanks for the giveaway! I currently have the UGLIEST ceiling light in my dining room. That Tord Boontje lamp would make my life so much better. i love this! i thought i already posted a comment, but it doesn't look like it showed up... here goes again. Placemats or lamp? Placemats or lamp? Such a tough decision. that lamp is perfect, exactly what I need for my new place! such a great giveaway, anabela! sweet picks anabela! i love all three. i've had my eye on one of those lamps for the longest time. thanks lady!! what a great giveaway -thank you! Oh this is just lovely - what a treat. This is such an amazing giveaway! I was not familiar with All Modern, and now I am totally in lust with everything they offer. I particularly love the Herman Miller Eames Lounge and Ottoman - what a perfect addition to my apartment (in my dreams!). Seriously, free shipping for Canada? Now I'm really excited!! I'd pick the Grandsire Tufted Sofa because it's on sale & affordable and we're really jonesing for a new sofa around here. As for your picks, nicely done! Love! So happy to have a giveaway like this on a Canadian blog, not limited to the US! So much to love on their site! oooh, there is a lot of amazingness to choose from. I don't seem to have very good luck with giveaways, but this one is definitely worth entering! Great things you've picked out! wow! i had no idea All Modern existed - what a great shop. and for simon, anything from kittypod! lovely picks, by the way, anabela. ps. i'm going to go tweet about this now! I recently stumbled upon your lovely blog and I'm in love with all the beautiful blouses and dresses that you make. So inspired that I've taken the plunge and started sewing again! I am so glad that I found your blog. First you showed me The Stylish Dress book and now this site, http://www.allmodern.com/ which might not be good for my wallet but will most definitely make my tiny apartment smile! Oh, and their kids furniture makes me want to procreate. The Artecnica - Midsummer Light is so beautiful. I would choose it for sure. Thank you for the heads-up on Kittypod! I have been looking for these ever since I saw a photo of one online. My niece wants to get the big bowl shaped one for her lil furry guys. Exquisite choices! The Midsummer Light is one I've lusted after for years- I first saw it while living in Chicago almost 6 years ago, but haven't had a spot for it till very recently. Merci for this lovely giveaway! Can I win those placemats? They would certainly encourage me to eat at the table instead of on the couch. The duvets are absolutely wonderful - the larch organic bark in particular would fit perfectly in my bedroom! oh I love that lamp!! And looking around, I started in the kids-toys section; since I now have a week old nephew, babies are on the brain. But I'd love to get him the Mack Play Tent (Blue and orange stripes is my favorite) and play for hours one day!! The Pearl Chinoiserie Duvet Collection is to die for! The blanket is beautiful, i would have to pick that! Thank you Anabela for this lovely opportunity! If I won I would definitely chose the lamp but it's a hard choice because I am always wishing I had a little throw blanket and I loooove Dwell. I own a bedset from them and adore it. I love the Lamps Arc Floor Lamp with Brown Fabric Shade by George Kovacs http://www.allmodern.com/George-Kovacs-by-Minka-P607-077-GKV1665.html, it has just the right amount of class and modern sensibility. I would choose the Midsummer Light. I love Tord! My favorite thing from All Modern has to be the Kartell - Componibili Round Tower - Two Doors http://www.allmodern.com/Kartell-4966-KTL1140.html in white of course! There's nothing better than that lamp!! I've been in love with the Polder Sofa since it came out - incredible! I would choose the light, it's stunning! ur so awesome!! i love Slipcover Headboard in BandanaTaupe by Skyline Furniture!!! and i would choose the blanket!!! Holy moly! What a great giveaway. You weren't kidding! Sign me up! Oh my gosh, that Midsummer Night lamp is gorgeous - that's my pick for sure! Thanks so much for doing this giveaway! I also love the persimmon hedgerow bedding...such a lovely, seasonal shade. it'd be hard to choose just one!! thanks anabela! i am totally dreaming about an Eames Lounger with Ottoman. We just moved into a much smaller space and this would fit the bill so nicely. oh! i love EVERYTHING about dwell studio. it just makes me swoon! i love the blanket, but i think i would have to go with the vellum placemats, as a large black lab is not conducive to keeping ANYTHING clean! i'm now addicted to all modern - thanks! ohhh what a fabulous website that is. i would most definitely choose the midsummer light. this old house is in some serious need of prettier overhead lighting. oooh, I have always dreamed of the Kartell componibili unit for my bathroom...how cute would it look in a white white room with the Midsummer Light? I swoon. And reblogged the contest on my site, here...happy Monday! I swoon for Tord Boontje and I've been thinking about getting one of his lamps, but it might be too heavy - oh no! It seems the only lighting fixture my mangled ceiling can support is a paper lamp from IKEA. The knit blanket looks like a sweet option, and this coral print rug is also awesome. The Midsummer Light is completely dreamy in that photo! I also like the Milk Bottle Chandelier from the website-that brought a smile to my face. the midsummer light is so whimsical! Very cool items, thanks for the giveaway. I'd definitely choose the Tord Boontje lamp. It's amazing. I do love Dwell's chinoiserie design, but I'd probably be too afraid to spill on the placemats. I would choose the lamp. It reminds me of Rob Ryan's paper cuts. And when we save enough up,the Jane or the Spencer sofa would be perfect! Great choices, Anabela! It would be difficult to choose one of those three!! But I do love the lamp. thanks for the awesome giveaway! So hard to choose which one is my fav...but I guess I have to say the Boontje. I also love the bedding in that picture. I love that site! I have that beautiful bird bedding, but would love to get those matching throw pillows they have! Incredible! I would have to pick the blanket, it looks so warm and cuddly! Thanks for the opportunity! I would have to chose the blanket to keep the baby on the way safe from the prairie gales. It's so lovely. Great giveaway! I love the light in your blog post. Personally, I would love a Bertoia chair. Keeping my eye out for deals ;). I would love to cuddle up with that blanket. freaking-awesome giveaway! tough call with those gorgeous placemats in the running, but i would have to pick the Midsummer Light... it would be too perfect in my office! oh good.ness. couldn't have chosen lovelier picks myself. such a toss up between the soft blanket and the soft light! and my ideal bedding? soft, soft. but something that stays put. never could stand it when the sheets got all bunchy. i'll post a little something on my space, too! xo. oh wow! midsummers light, beautiful. really great give away! I have forever loved the chinoiserie line by Dwell Studio, like many other of your readers. Thus, if I had my pick, the place mats would be mine! Place mats always are fantastic. Oh I love those Midsummer lamps! I've wanted some for so long but my massive heap of student loan debt is keeping me from such lovely things. The lamp would absolutely perfect next to my bed. But all of your selections were fabulous! Here's hopin' I'm your lucky winner. I would love to decorate my whole house from all modern, starting with a Blu Dot Bonnie sofa! i wish i had that blanket wrapped around me right now!! thank you for the opportunity! that blanket looks perfect for this chilly evening, and snow is supposed to visit us tomorrow! Wow, that's a tough one. I'd have to go with the Organic Knit Blanket though if I one. Other things I liked from their site are all in the tea section :) Namely the Miami 59 oz. Kettle, the Sibo tea strainer and the Opal Chrome Thermal Carafe. ooh, they're all so pretty. you can never have too many blankets, though.. I love the rug section--it's hard to find interesting rugs in most stores, and the one with the large damask pattern in powder blue is very cute. What a nice site! i love your choices! i've always wanted the vioski palm chair... so awesome, so retro. I'm about to move into a new apartment and that lamp would look so lovely in our new bedroom. I'm also lusting after modern.com's linens. I'm in love with the lamp..Too bad they don't ship international! thank you for the opportunity, Anabela! much as i love the lamp, looking out at the pouring rain makes me crave that blanket more..
how exciting for you to be hosting a give away!! I would chose 1. or 3. I would actually choose 2. but I rent and I also live in Australia, so that would be hard to post and hard to install in a rental!! I probably would love the blanket the mostest, even though we are going into summer. It is websites like all modern that make me wish international shipping was FREE!!! What wonderful goodies! Please add me to the list (Elizabeth Dodge Jordan) and email me at elsie.d.jordan@gmail.com if I am lucky enough to win. I need to do up my little place on this side of the world! 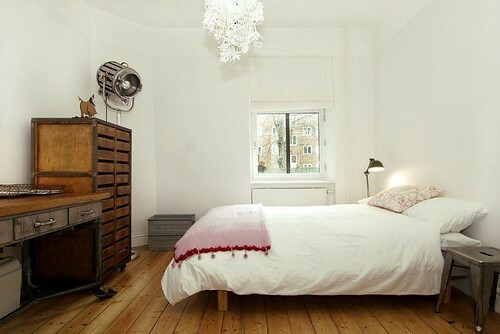 oooh i love the little eames-inspired side table here, and i love the lamp!! I love the blanket! I also love the light! I would be happy with either, oh yes. Although,these nights are getting chilly, and these bones won't warm themselves. Wrap me up in some Egyptian cotton, I think. Oh, I would definately choose the vellum placemats, it looks so beautiful on that table! It could be my table!!! LOVELY. i have been pining over the dwell studio bedding for years too. it is so beautiful. i would have to choose the knit blanket if i were so lucky as to win. my new little one would love to be wrapped up in it, as would i.
ooh, picking just one item is a tough call! i'd probably go for the light with the blanket being a close second. thanks so much for posting this giveaway! Love all the items you picked, but the Midsummer Light is especially gorgeous and totally one of a kind <3 thanks for being so generous! I think I'd have to go for that blanket. Looks so cozy! I've been dreaming about that Tord Boontje lamp for a while now! It's so wispy and magical. The lamp is so beautiful and airy. I bet it casts beautiful shadows. All Modern is All You Could Ever Need. Shopping the site was easy & fun! I found a place for a few things I didn't know I needed. The Dwell Studio Vellum Chionoiserie Placemats are Lovely. I will post your giveaway on Twitter at fuzzbonnet. Wow! The lamps are amazing. I might just have to get one even if I don't win. Oh, my goodness... I'd go for the Midsummer Light, and I'd hang it in my freshly painted bedroom in a flash. having that light would make my heart sing a beautiful, beautiful song.... oh yes it would! thank you for having such a lovely giveaway. Let me win that lamp. that lamp pretty much makes me cry with happiness. i love looking at the eames rockers. if only i had one in my living room to look at all day long. your choices are lovely. i want to curl up with that blanket and a book right now. the lamp is lovely! I am always seeing it about the interwebs and wanting it! I want that lamp! I adore it. My bed needs to have it hanging over top of it. i have to say, the kitchen section is my weakness. thanks for such a lovely give away! i adore the midsummer light! i recently moved to the west coast and the rainy, grey days make me yearn for amazing lighting at home. tweeted this for my friends to see! ok lady i blogged about it haha. of course i love the midsummer light. always a sucker for lighting, and that's a classic! i love the blanket the most, though all the picks are nice. thanks for hosting such a wonderful giveaway. This is the most fabulous giveaway I have ever seen!! I would most definitely choose the lamp. It is perfection. Wonderful! So hard to choose. I will pick the "chandalier" i think if i win. i linked ya on Twitter. jlynnebee. first time here...LOVE your blog!! Oh my goodness, I LOVE those place mats! I have been looking for something lovely like those. I feel that if I had pretty place mats I might actually serve dinner on the kitchen table! Who doesn't love all things Dwell Studio! That said that lamp is gorgeous, I would have to go for that. i love the organic blankets. like that knit blanket you have shown or the Larch Organic Bark Duvet. it's just dreamy. i would love to buy organic blankets but they are just so darn expensive.... but then again they look heavenly. THIS IS THE MOST BEAUTIFUL RUG I'VE EVER SEEN!!!!! You're a genius for thinking of this, and would love the opportunity to have something by this company in my home. Your Midsummer Light lamp is a work of art! I also like this hand vase/candle holder. It's quite surreal. Great picks!! I'm personally in love with the George Nelson lamps! I am also in love with the middle photo you've posted... love the rustic furniture! i hope i'm the lucky random winner! The Midsummer Light by Tord Boontje makes my heart flutter. I'd pick that for sure. If I won, I'd pick the blanket. I've been on the hunt for a perfect white throw, & I think I've found it! I think I am in love with everything over there! I would choose the light it's absolutely stunning although I wish it was hardwired I hate dealing with long plug in cords. I love all things Tord Boontje! Have you seen his book? Beautiful! holy wow anabela! look at all these comments. i too am in love with that lamp and would love to see it lighting my little apartment. What a great giveaway! Thanks for posting about this site - it's new to me, and I think I'll be spending quite a bit of time checking out all their fabulous offerings! I'm loving the light you posted, and would certainly love a chance to win one! I would love a H. Miller rocker & if I won this I would choose the blanket. Thanks! That knit blanket looks awfully cozy, but all three of your picks are great. What a decision for the lucky winner! Oh, just like you, I think the lamps the thing! I love the placemats you featured as well as these serving pieces - http://www.allmodern.com/Gense-7748850-GES1126.html. Nice site, well organized. Oh amazing! and free shipping too. It is a tough choice between the light and the blanket. Oh...the Midsummer light..! I've been loving it from afar for a long time now... What a wonderful giveaway - thank you. oh dear! i love them all. maybe the light cause im buying a new house soon, or maybe the blanket cause im trying to get prego, or maybe the placemats because birds are my and my gramma's favorite things! what a great site! I particularly love the cozy dwell blanket. nice. oh I love the lampshade too !! id pick that. the knit blanket is awesome! I would love the organic knit blanket. Ownership of my "couch cuddle" blanket was usurped by my beagle, so now I have nothing to keep my lap warm on TV nights when I eat ice cream. in my dreams i would love the Gus Modern - Jane Loveseat, but the lampshade you picked is beautiful! Hard to choose, the light or the blanket, probably the beautiful blanket. Hope I am not too late.